Spinal cord stimulation (SCS) has become a standard treatment for patients with chronic pain in their back and or limbs who have not found pain relief from other treatments. Most patients who qualify for neurostimulation therapy report a 50 to 70% reduction in overall pain, as well as an increased ability to participate in normal family and work activities. Many patients find that they can decrease or stop taking painkillers or other pain medications after undergoing spinal cord stimulation. Given these benefits, there has been ongoing investment and advances in spinal cord stimulation technology, and many individuals suffering from chronic pain find that neurostimulation positively impacts the quality of their lives. 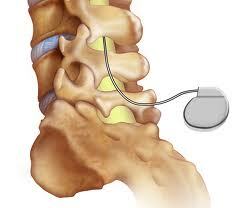 Spinal cord stimulation (SCS): In spinal cord stimulation, soft, thin wires with electrical leads on their tips are placed through a needle in the back near to the spinal column. The leads are placed through a needle inserted in the back (no incision is required). A small incision is then made and a tiny, programmable generator is placed in the upper buttock or abdomen (under the skin) which emits electrical currents to the spinal column. Peripheral Nerve Field Stimulation (PNFS): Very similar to spinal cord stimulation, peripheral nerve field stimulation involves placing the leads just under the skin in an area near to the nerves involved in pain. In both approaches, the generator can be programmed in a way similar to using a remote control to adjust the television. The area or intensity of electrical stimulation can be changed, and the system can be turned on and off or adjusted as necessary to provide optimal pain relief. Although programming is initially done at the physician’s office, patients can learn how to control the stimulation on their own and adjust it to their pain levels. Failed back surgery syndrome: chronic pain after one or more back or neck surgeries to fails to alleviate persistent low back pain, leg pain (sciatica or lumbar radiculopathy) or arm pain (cervical radiculopathy). Reflex sympathetic dystrophy (complex regional pain syndrome): a progressive disease of the nervous system in which patients feel constant burning pain. Causalgia: chronic pain with a burning sensation caused by peripheral nerve injury. You can also book an appointment over phone by calling us on 011-39595696 or Here Online !